To add an annotation, click on the [Insert annotation icon] on the left toolbar. Every time you click on this icon, you add a layer to the slide. A grey square appears on the canvas and its timeline appears under the canvas. The grey box is what a user clicks to opens up the URL stated in the Properties > Annotation section of the Properties panel on the right of the canvas. To adjust size of clickable area to the whole slide, move the grey square to the top left, then drag its bottom right corner down and to your right to expand it fully till it fills up the whole slide. 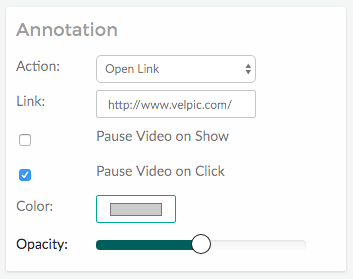 To set the action, choose ‘open link’, ‘play’ or ‘pause’ from Annotation > Action. Different contextual sub-actions are available based on your choice. You may change the opacity (or transparency) of the clickable area via Annotation > Opacity, or set this value as zero to make the annotation ‘invisible’. You may change its colour from grey to another colour via Annotation > Colour. As an option, if you set the annotation on Pause and make the annotation ‘invisible’ by setting Opacity to zero, you may like to add a text layer to ask them to click on the slide for a desired outcome. The outcome could be to open a webpage, download a document, play a video or more. Anything is possible as long as that content is on the URL that the annotation points to.